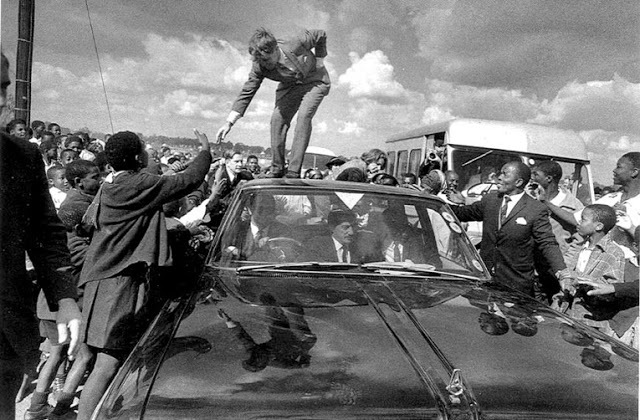 More than 50 years after Robert Kennedy's speech in Cape Town, there have been many victories in the fight for political rights and against racial discrimination in both South Africa and the United States. The sacrifices and victories of those decades should not be discounted. Nevertheless, despite the advance of many African Americans and Black South Africans into positions of power and wealth, the inequality inherited from that history remains deeply imprinted in the society and the economy. Its effects are felt not only in the explicit racial inequalities that still exist, but also in the ideologies rationalizing inequality more generally and legitimizing structural inequalities as the allegedly deserved outcome of individual achievement. The World Inequality Report, just released, documents with the best data available on the trends of inequality at global and national levels, a necessary but of course insufficient step in finding remedies to reverse the trend of increasing inequality and to repair the damages still felt from historical inequities. This AfricaFocus Bulletin contains excerpts from the chapters on South Africa and the United States from the new World Inquality Report. Excerpts from the executive summary of the report appear in another AfricaFocus Bulletin sent out today and available at http://www.africafocus.org/docs18/ineq1801.php. South Africa stands out as one of the most unequal countries in the world. In 2014, the top 10% received 2/3 of national income, while the top 1% received 20% of national income. During the twentieth century, the top 1% income share was halved between 1914 and 1993, falling from 20% to 10%. Even if these numbers must be qualified, as they are surrounded by a number of uncertainties, the trajectory is similar to that of other former dominions of the British Empire, and is partly explained by the country's economic and political instability during the 1970s and 1980s. During the early 1970s the previously constant racial shares of income started to change in favor of the blacks, at the expense of the whites, in a context of declining per capita incomes. But while interracial inequality fell throughout the eighties and nineties, inequality within race groups increased. Rising black per capita incomes over the past three decades have narrowed the interracial income gap, although increasing inequality within the black and Asian/Indian population seems to have prevented any decline in total inequality. Since the end of Apartheid in 1994, top-income shares have increased considerably. In spite of several reforms targeting the poorest and fighting the segregationist heritage, race is still a key determinant of differences in income levels, educational attainment, job opportunities and wealth. South Africa is one of the most unequal countries in the world. In 2014, the top 10% of earners captured two thirds of total income. This contrasts with other high-income inequality countries such as Brazil, the United States and India where the top 10% is closer to 50–55% of national income. However, unlike other highly unequal countries, the divide between the top 1% and the following 9% in South Africa is much less pronounced than the gap between the top 10% and the bottom 90%. Otherwise said, in terms of top income shares, South Africa ranks with the most unequal Anglo-Saxon countries, but, at the same time, there is less concentration within the upper income groups, mostly composed by the white population. The average income among the top 1% was about four times greater than that of the following 9% in 2014 (for comparative purposes, the top 1% in the United States earn seven times more than the following 9%), while average income among the top 10% was more than seventeen times greater than the average income of the bottom 90% (it is eight times more in the United States). It is then only logical that the income share of the top 1% is high, capturing 20% of national income, though this is not the largest share in the world. The South African "dual economy" can be further illustrated by comparing South African income levels to that of European countries. In 2014, the average national income per adult among the richest 10% was €94 600, at purchasing power parity, that is, comparable to the average for the same group in France, Spain or Italy. But average national income of the bottom 90% in South Africa is close to the average national income of the bottom 16% in France. In light of these statistics, the recently debated emergence of a so-called middle class is still very elusive. Rather, two societies seem to coexist in South Africa, one enjoying living standards close to the rich or upper middle class in advanced economies, the other left behind. South Africa is an exception in terms of data availability in comparison with other African countries. The period for which fiscal data are available starts in 1903 for the Cape Colony, seven years before the Union of South Africa was established as a dominion of the British Empire, and ends in 2014, with some years sporadically missing, and noticeably an eight- year interruption following the end of apartheid in 1994. As is often the case with historical tax data series, only a very small share of the total adult population was eligible to pay tax in the first half of the twentieth century. Therefore, the fiscal data from which we can estimate top-income shares allows us to track the top 1% income share since 1913, but only cover the top 10% of the population from 1963 (with a long interruption between 1971 and 2008). With important short run variations, the evolution of income concentration over the 1913–1993 period seems to follow a very clear long-term trend. The income share of the richest 1% was more than halved between 1913 and 1993, falling from 22% to approximately 10%. Not only did the income share attributable to the top 1% decrease, but inequality within this upper group was also reduced. Indeed, the share of the top 0.5% fell more quickly than the share of the next 0.5% (from percentile 99 to percentile 99.5). Consequently, while the top 0.5% represented about 75% of the top 1% in 1914, by the end of the 1980s, their representative proportion fell to 60%. Despite the extreme social implications of the first segregationist measures that were implemented in the early 1910s, these policies did not lead to large increases in income concentration among the top 1%. This was also a time in which South Africa progressively developed its industrial and manufacturing sector, enjoying notable accelerations in the 1930s that were to the benefit of the large majority of the population. Aside from a brief fall during the Great Depression, average real income per adult then increased steadily. Following a trend similar to other former Dominions of the British Empire (Australia, Canada and New Zealand) inequality decreased significantly in South Africa from 1914 to the beginning of the the Second World War, despite some short-run variations in the late 1910s: the income share of the top 1% fell from 22% to 16%. During the Second World War, national average continued to follow its previous trend, but the average real income of the richest 1% took off. As a consequence of the demand shock during the war, the agricultural export prices boomed, the manufacturing sector more than doubled its output between 1939 and 1945, and profits for the foundry and engineering industries increased by more than 400%. However, the wage differential between skilled/white and unskilled/black workers remained extremely large. As C.H. Feinstein described, "black workers [were] denied any share of the growing income in the new economy they were creating." The fact that the peak in the income share of the top 1%--as high as 23% in 1946--was concomitant with the war effort thus seems essentially due to a brief enrichment of the upper class. In contrast, income growth in the 1950s was more inclusive, as average real income per adult increased by 29% between 1949 and 1961, while the average real income of the top 1% slightly decreased. By 1961 the income share of the top 1% had fallen to around 14%. In the 1960s, both averages grew approximately at the same rate such that inequality remained relatively constant. Following 60 years of successive increases, national average income was almost four times greater by the early 1970s than in 1913. Inequality resumed its downward sloping trend from 1973, but this also marked a period of overall income growth stagnation in South Africa until 1990 that culminated in a three-year recession. For the first time in the previous 90 years, gold output started falling. Richer seams were exhausted and extraction costs increased rapidly. The industry that was once the engine of the economy started to weaken. Increases in oil prices and other commodities accelerated inflation dramatically, averaging about 14% per year between 1975 and 1992. In the 1980s, international sanctions and boycotts were placed on South African trade as a response to the apartheid regime, adding further pressure to that created by domestic protests and revolts, and contributed to the destabilization of the regime in place. White dominance was challenged on both economic and political grounds, to which the ruling government progressively made concessions, recognizing trade unions and the right to bargain for wages and conditions; this could partly explain why the average real income per adult of the top 1% decreased faster than the national average. There are no fiscal data to estimate top-income shares for the eight years that followed 1993. However, joining up the data points to the next available figure in 2002 suggests that income inequality has increased sharply between the end of apartheid and the present, even if the magnitude of the increase must be taken with caution, as the estimates in these two periods may not be totally comparable. The income share of the top 1% increased by 11 percentage points from 1993 to 2014. Part of the increase from 1993 to 2002 should come from changes in the tax code. In particular, before 2002, capital gains were totally excluded, which is very likely to downward bias the share of top-income groups. Also, the tax collection capabilities seem to have increased substantially in the last years. That being said, household survey data for the years 1993, 2000 and 2008 research has demonstrated that inequality increased significantly during the period for which we have no fiscal data. At first, it might seem puzzling that the abolishment of a segregationist regime was followed by an aggravation of economic inequality. The establishment of a multiracial democracy, with a new constitution and a president of the same ethnic origin as the majority of the population, did not automatically transform the inherited socio-economic structure of a profoundly unequal country. Interracial inequality did fall throughout the eighties and nineties, but inequality within race groups increased: rising black per capita incomes over the past three decades have narrowed the black-white income gap, although increasing inequality within the black and Asian/Indian population seems to have prevented any decline in aggregate inequality. In explaining these changes scholars agree in that the labor market played a dominant role, where a rise in the number of blacks employed in skilled jobs (including civil service and other high-paying government positions) coupled with increasing mean wages for this group of workers. Since 1994, several redistributive social policies have been implemented and/or extended, among which important unconditional cash transfers targeting the most exposed groups (children, disabled and the elderly). At the same time, top marginal tax rates on personal income were kept relatively high and recently increased to 45%. However, in spite of these redistributive policy efforts, surveys consistently show that top-income groups are still overwhelmingly white. Other studies further demonstrate that such dualism is itself salient along other key dimensions such as unemployment and education. Furthermore wealth, and in particular land, is still very unequally distributed. In 1913, the South African parliament passed the Natives Land Act which restricted land ownership for Africans to specified area, amounting to only 8% of the country's total land area, and by the early 1990s, less than 70 000 white farmers owned about 85% of agriculture land. Some land reforms have been implemented, but with seemingly poor results, and it is likely that the situation has not improved much since, although precise data about the recent distribution of land still needs to be collected. Given this socio-economic structure, the interruption of the international boycotts in 1993 might have more directly favored a minority of high skilled and/or richer individuals who were able to benefit from the international markets, which therefore contributed to increase inequality. This hypothesis would also explain the fact that income inequality in South Africa did not increase in the 1980s, while boycotts were put in place, contrary to other former Dominions (New Zealand, Canada and Australia) despite the country having so far followed a similar trend. Furthermore, the implementation of the Growth, Employment and Redistribution (GEAR) program in 1996, which consisted of removing trade barriers, liberalizing capital flows and reducing fiscal deficit might also have contributed, at least in the short run, to enrich the most well off while exposing the most vulnerable, in part by increasing returns to capital over labor and to skilled workers over unskilled workers. The rapid growth experienced from the early 2000s until the mid-2010s was essentially driven by the rise in commodity prices and was not accompanied with significant job creation as the government hoped it would. The income share of the top 1% grew from just less than 18% in 2002 to over 21% in 2007, then decreased by about 1.5 percentage points and increased again in 2012–2013 as prices reached a second peak. The fact that these variations closely mirror the fluctuation in commodity prices suggest that a minority benefiting from resource rents could have granted themselves a more than proportional share of growth. Lastly, it should be stressed that the top 1% only represents a small part of the broader top 10% elite which is mostly white. While the share of income held by the top 1% is relatively low as compared to other high inequality regions such as Brazil or the Middle East, the income share of the top 10% group is extreme in South Africa. The historical trajectory of the top 10% group may be different to that of the top 1%--potentially with less ups and downs throughout the 20th century. Unfortunately at this stage, historical data on the top 10% group does not go as far back in time as for the top 1% group." Average pre-tax real national income per adult has increased 60% since 1980, but it has stagnated for the bottom 50% at around $16 500. While post-tax cash incomes of the bottom 50% have also stagnated, a large part of the modest post-tax income growth of this group has been eaten up by increased health spending. Income has boomed at the top. While the upsurge of top incomes was first a laborincome phenomenon in 1980s and 1990s, it has mostly been a capital- income phenomenon since 2000. Income is very concentrated, even among the top 10%. For example, the share of national income going to the top 1%, a group of approximately 2.3 million adults who earn $1.3 million on average per annum, is over 20%--that is, 1.6 times larger than the share of the entire bottom 50%, a group fifty times more populous. The incomes of those in the top 0.1%, top 0.01%, and top 0.001% average $6 million, $29 million, and $125 million per year, respectively, before personal taxes and transfers. Income inequality in the United States in 2014 was vastly different from the levels seen at the end of the Second World War. Indeed, changes in inequality since the end of that war can be split into two phases, as illustrated by Table 2.4.2 . From 1946 to 1980, real national income growth per adult was strong--with average income per adult almost doubling-- and moreover, was more than equally distributed as the incomes of the bottom 90% grew faster (102%) than those of the top 10% (79%). However, in the following thirty-four-year period, from 1980 to 2014, total growth slowed from 95% to 61% and became much more skewed. The pre-tax incomes of the bottom 50% stagnated, increasing by only $200 from $16 400 in 1980 to $16 600 in 2014, a minuscule growth of just 1% over a thirty-four-year period. The total growth of post-tax income for the bottom 50% was substantially larger, at 21% over the full period 1980–2014 (averaging 0.6% a year), but this was still only one-third of the national average. Growth for the middle 40% was weak, with a pre-tax increase in income of 42% since 1980 and a post-tax rise of 49% (an average of 1.4% a year). By contrast, the average income of the top 10% doubled over this period, and for the top 1% it tripled, even on a post-tax basis. The rates of growth further increase as one moves up the income ladder, culminating in an increase of 636% for the top 0.001% between 1980 and 2014, ten times the national income growth rate for the full population. This stagnation of incomes of the bottom 50%, relative to the upsurge in incomes experienced by the top 1% has been perhaps the most striking development in the United States economy over the last four decades. As shown by Figure 2.4.1a , the groups have seen their shares of total US income reverse between 1980 and 2014. 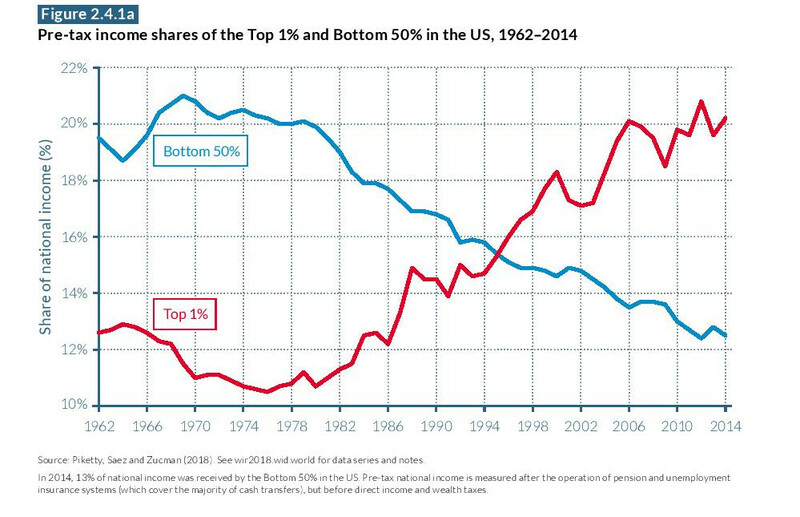 The incomes of the top 1% collectively made up 11% of national income in 1980, but now constitute above 20% of national income, while the 20% of US national income that was attributable to the bottom 50% in 1980 has fallen to just 12% today. Effectively, eight points of national income have been transferred from the bottom 50% to the top 1%. ... This has increased the average earnings differential between the top 1% and the bottom 50% from twenty-seven times in 1980 to eighty-one times today. The stagnation of incomes among the bottom 50% was not the case throughout the postwar period, however. The pre-tax share of income owned by this chapter of the population increased in the 1960s as the wage distribution became more equal, in part as a consequence of the significant rise in the real federal minimum wage in the 1960s, and reached its historical peak in 1969. These improvements were supported by President Johnson's "war on poverty," whose social policy provided the Food Stamp Act of 1964 and the creation of the Medicaid healthcare program in 1965. However, the share of both pre-tax and post-tax US income accruing to the bottom 50% began to fall notably from the beginning of the 1980s, and the gap between pre-tax and post-tax incomes also diverged significantly from this point onwards. Indeed, the data indicate that virtually all of the meager growth in the real post-tax income of the bottom 50% since the 1970s has come from Medicare and Medicaid. Excluding these two health care transfers, the average post-tax income of the bottom 50% would have stagnated since the late 1970s at just below $20 500. The bottom half of the US adult population has therefore been effectively shut off from pre-tax economic growth for over forty years, and the increase in their post-tax income of approximately $5,000 has been almost entirely absorbed by greater health-care spending, in part as a result of increases in the cost of healthcare provision. The progressivity of the US tax system has declined significantly over the last few decades, as illustrated in Figure 2.4.6 . The country's macroeconomic tax rate (that is, the share of total taxes in national income including federal, state, and local taxes) increased from 8% in 1913 to 30% in the late 1960s, and has remained at the latter level since. Effective tax rates have become more compressed, however, across the income distribution. In the 1950s, the top 1% of income earners paid 40%--45% of their pre-tax income in taxes, while the bottom 50% earners paid 15–20%. The gap in 2014 was much smaller. In 2014, top earners paid approximately 30%–35% of their income in taxes, while the bottom 50% of earners paid around 25%. In contrast to the overall fall in tax rates for top earners since the 1940s, taxes on the bottom 50% have risen from 15% to 25% between 1940 and 2014. This has been largely due to the rise of payroll taxes paid by the bottom 50%, which have risen from below 5% in the 1960s to more than 10% in 2014. While taxes have steadily become less progressive since the 1960s, one major evolution in the US economy over the last fifty years has been the rise of individualized transfers, both monetary and in-kind. Public-goods spending has remained constant, at around 18% of national income, but transfers--other than Social Security, disability, and unemployment insurance, which are already included in calculations of pre-tax income--increased from around 2% of national income in 1960 to 11% in 2014. The two largest transfers were Medicaid and Medicare, representing 4% and 3%, respectively, of national income in 2014. Other important transfers include refundable tax credits (0.8% of national income), veterans' benefits (0.6%), and food stamps (0.5%). Perhaps surprisingly, individualized transfers tend to target the middle class. Despite Medicaid and other means-tested programs which go entirely to the bottom 50%, the middle 40% received larger transfers in 2014 (totaling 16% of per-adult national income) than the bottom 50% of Americans (10% of per-adult national income). ... These transfers have been key to enabling middle-class incomes to grow, as without them, average income for the middle 40% would not have grown at all between 1999 in 2014. By contrast, transfers have not been sufficient to enable the incomes of the bottom 50% to grow significantly and counterbalance the collapse in their pre-tax income. Still, considerable gender inequalities persist, particularly at the top of the labor income distribution, as illustrated by Figure 2.4.9 . In 2014, women accounted for close to 27% of the individuals in the top 10% of the income distribution, up 22 percentage points from 1960. Their representation, however, grows smaller at each higher step along the distribution of income. Women make up only 16% of the top 1% of labor income earners (a 13 percentage point rise from the 1960s), and only 11% of the top 0.1% (an increase of 9 percentage points). There has been only a modest increase in the share of women in top labor income groups since 1999. The glass ceiling is still far from being shattered.